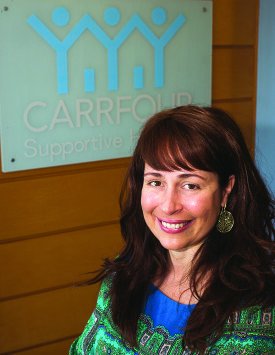 Stephanie Berman-Eisenberg is the president of Carrfour Supportive Housing, a nonprofit organization established by the Greater Miami Chamber of Commerce in 1993 to develop supportive housing for homeless individuals in Miami-Dade County. In addition to overseeing Carrfour’s current inventory of approximately 1,742 supportive housing units and more than 3,300 residents, Ms. Berman-Eisenberg has led the effort to assemble millions of dollars in funding to develop an additional 500 units over the next few years. Ms. Berman-Eisenberg’s professional achievements have been recognized by Real Estate Forum Magazine, the Miami Herald, and the South Florida Business Journal, among other publications. She serves on the City of Miami Beach Affordable Housing Committee, Greater Miami Chamber of Commerce Affordable Housing Committee, and the JPMorgan Chase Community Advisory Committee. Ms. Berman earned a Master’s degree in administration, planning, and social policy from Harvard University’s Graduate School of Education, and a Bachelor’s degree from Brandeis University.